Published in the February issue of Rhythms. Full, unedited story below. New Orleans, N’Awlins. Squatting on the banks of the thick, slow-running Mississippi river, an ancient, gnarled old man of a city – the Big Easy – languid in the oppressive heat, creaking and cracking; its streets running down to the old port, greasy watered; its history leaking, seeping from every building, cobblestone, creases on faces, where grown men sweat 24 hours a day. It’s a city of Sin to be sure, a unique city that seems at odds with the ubiquitously rampant conservatism that defines America these days, but one gets the impression that down Louisiana way, they do things differently. As such, it’s also a city of music, a city of a million cultures and creeds which breed their own sounds, mixing and melding, taking from one, giving to another and so this uniqueness shines and booms, it rockets from the mouths of horns and falls from strings, vocal chords, skins and reeds like nothing else you’ll hear anywhere else. Indeed, walk down the street in the Crescent City and music will take you, whether it be blaring from open club doors, filtering from windows high above the street-level bustle, emanating from groups busking on all corners and in all doorways, a veritable feast from which there is no escape, no end, no menu. N’Awlins is the real deal, of this you can be sure. On the street is where our story begins then, specifically in the French Quarter, even more specifically with seven-piece Tuba Skinny. In 2009, these feisty cats came together, long-standing friendships solidifying into a unit, one which breaths rag-time blues and Dixie jazz, as easily as you or I breath air. Their sound is as old as the hills, but their youth brings to it a vitality, a freshness which takes the old music and makes it new again, something which is happening as we speak. “Currently, it’s a pretty vibrant street scene, the past few years there have been quite a number of… folks our age playing a lot of different styles of Americana and traditional jazz, and doing it really, really well,” observes vocalist Erika Lewis. She goes on to say that it’s been noticeable since Hurricane Katrina, back in 2005, that a younger generation of musicians have been drawn to the city, inspired by what’s come before them, but looking to move it ahead, even subconsciously, as is the case with Tuba Skinny. Take off it did, the band almost immediately heading over to Europe to busk, along the way taking, as Lewis says, any opportunity that came their way – something which has seen them introduce themselves to the world. Over the past three and a half years, there aren’t many places on the planet the group haven’t been, Australia being no exception – when they’re here this very month, it’ll be for the third time in only a year and a half. It seems we here Down Under, have become quite taken with this laidback band of street players. “I’m not sure how, but it’s pretty amazing when people are so receptive to the music, we’ve been quite surprised,” Lewis smiles, not just referencing their Australian sojourns, but “most other places” they’ve played. “I think for one, it’s the type of music that we’re playing – it’s very straight forward, it’s meant to be social music, music to celebrate to. Speaking of physical things, we turn the conversation to records – just because The Skinny hail from street corners and alley ways, doesn’t mean they’re not want to capture places in time to share all over the world. However, herein lies a tricky proposition – how does a band like this one go about recording? 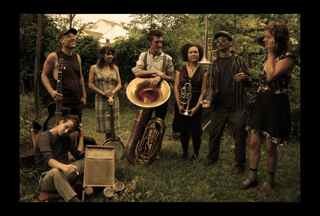 Their element lies in, and is fuelled by, the hustle and bustle of life on the street, it’s where they’ve cut their collective teeth, honed their collective chops – how do Tuba Skinny approach recording? Rag Band is pure music, being played purely for the sake of music – and perhaps this is the fact that it’s this music, but it just feels real, it’s like a band is playing, and someone else, unbeknownst to the band in question, has artfully placed a mic in the middle of the room, capturing exactly what needs to be captured. It’d be a relief to the band they’re able to record in such a way, not to mention a relief to their growing multitude of fans the world over. However, in true Tuba Skinny form, they’re not agonising over the record, it’s well done for them, and so they’re turning their attention to their next offering, which for Australian fans of the band, will be happening closer to their own front doors than they may realise. “Yeah, we’re planning on recording a new album actually, when we’re in Australia, in Tasmania,” Lewis confirms. “We’re definitely thinking about that, we’re really looking forward to it.” This will come as the band’s fifth release in only three and a half years – the word prolific hardly does them justice. These seven have seen more than enough in the past three and a half years to inspire them, and it’s coming out in their music, this old-time-for-the-new-time sound, so heavily rooted in old blues and jazz and rag time good times, yet wrought for today, which is a very important thing indeed. 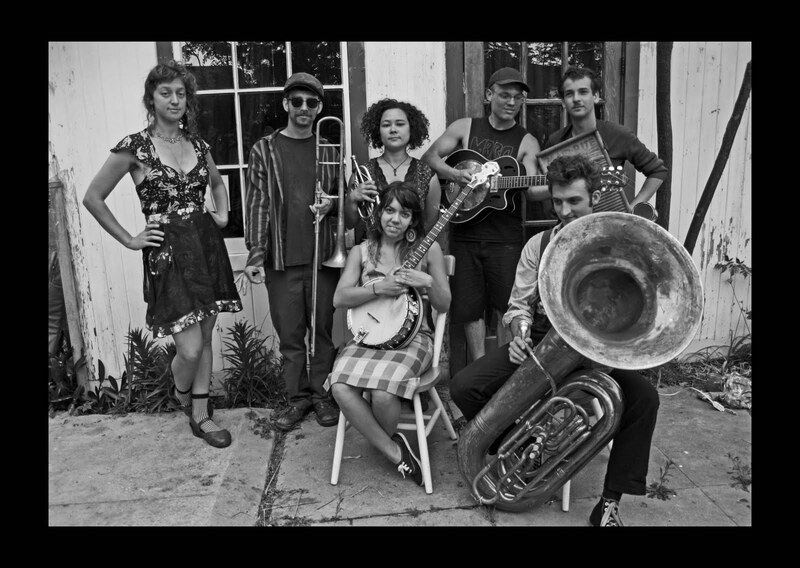 May the street music of New Orleans, along with Tuba Skinny, live on and on.